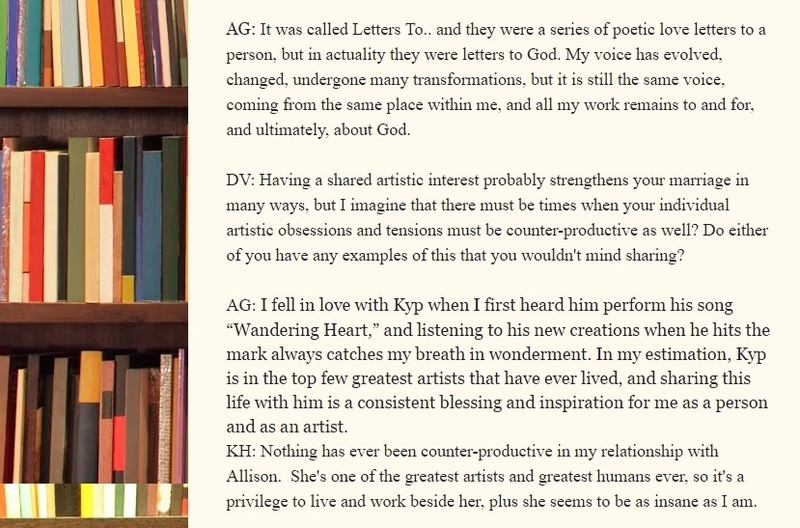 DV: How did both of you get started in your creative lives, especially in the word game? KH: I’ve been writing stories and drawing pictures almost since I can first remember. I’ve also always written songs in my head. AG: Writing and an appreciation of language has always been a part of my life, as both of my parents were writers/journalists. Writing just seemed like a natural way of expression to me from the beginning. When I was around five we moved to Spain for a year so my father could work on a novel. My mother and I would write stories together when I was in elementary school, though I didn’t start writing poetry until my first year of high school. I started sculpting and working in clay in my early 20s, and had a phenomenal teacher/mentor and friend in the late Elizabeth Fraser Williamson. DV: So you both got started very early, to the point where it was almost a biological development. Was there ever a time when either of you became jaded about the communication process and seriously considered doing something else with your lives? 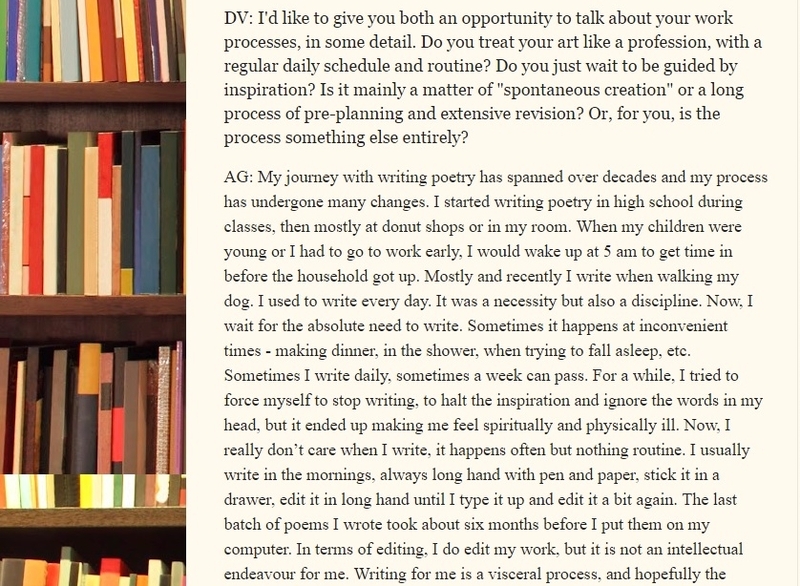 AG: No, for me, writing poetry is like eating, an essential part of my well-being and existence. I don’t like the publishing part of writing and stopped publishing for fifteen years – part of those reasons were practical – raising our two children – but during that time I always wrote and always planned to get that work out in book form. Yes, often I have felt the futility of being a poet and it has arrested my ability to create, but in the end I have learned that if I am going to continue on, I have to write. 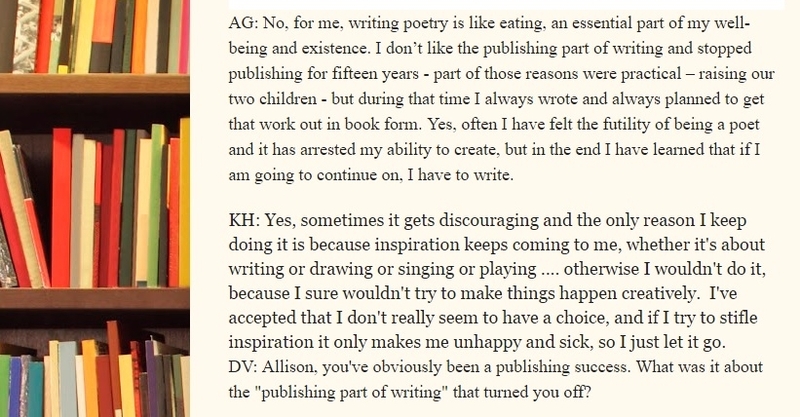 KH: Yes, sometimes it gets discouraging and the only reason I keep doing it is because inspiration keeps coming to me, whether it’s about writing or drawing or singing or playing….otherwise I wouldn’t do it, because I sure wouldn’t try to make things happen creatively. I’ve accepted that I don’t really seem to have a choice, and if I try to stifle inspiration it only makes me unhappy and sick, so I just let it go. DV: Allison, you’ve obviously been a publishing success. What was it about the “publishing part of writing” that turned you off? AG: I am a very private person and I don’t like putting myself out there or being exposed. I’d rather not, but it is a duty I owe to my art, so I did what I felt compelled to do, as a part of me feels that the completion of art only comes when sharing it. DV: You’re both multi-talented — poetry, prose, sculpture, music, cartoons — but if for some reason, Apollo’s jealous retribution for overweening hubris or some such, you could only practice one art exclusively, which one would it be? 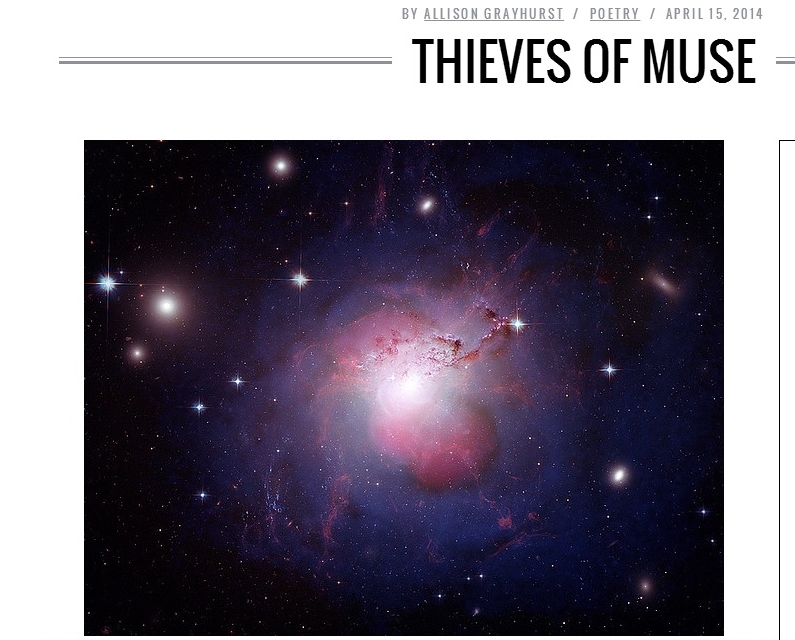 KH: I guess if I were forced to pick one it would be music since you can always get an instantaneous reaction from music, and through the years that I’ve been writing other stuff, which can often be a long slog, the music has kept me going just by playing it, and playing it with and for other people. AG: I enjoy sculpting, get a lot out of it and inspiration from it, but I don’t have to do it, and I have had to let it go at different times for extended periods of my life. Writing poetry for me is an integral part of myself and an ongoing necessity, so I would choose that. DV: Do you remember your first “successful” piece? (I don’t mean commercially successful or popular among your circle — I mean the first one that succeeded in inner terms of self-satisfaction that it had been done “right.”) Would it still pass the self-approval test today? 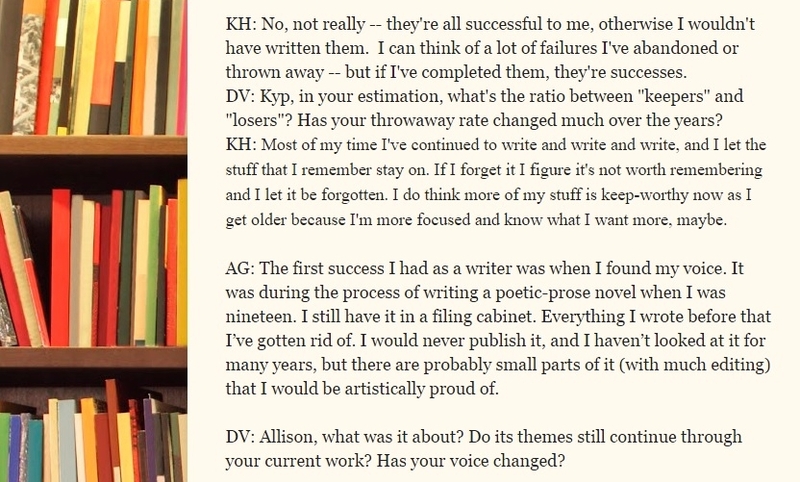 KH: No not, really — they’re all successful to me, otherwise I wouldn’t have written them. I can think of a lot of failures I’ve abandoned or thrown away — but if I’ve completed them, they’re successes. DV: Kyp, in your estimation, what’s the ration between “keepers” and “losers”? Has your throwaway rate changed much over the years? 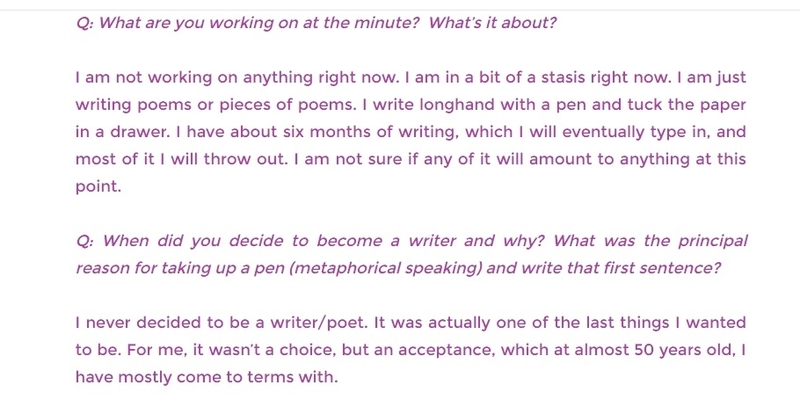 KH: Most of my time I’ve continued to write and write and write, and I let the stuff that I remember stay on. If I forget it I figure it’s not worth remembering and I let it be forgotten. I do think more of my stuff is keep-worthy now as I get older because I’m more focused and know what I want more, maybe. AG: The first success I had as a writer was when I found my voice. It was during the process of writing a poetic-prose novel when I was nineteen. I still have it in a filing cabinet. Everything I wrote before that I’ve gotten rid of. I would never publish it, and I haven’t looked at it for many years, but there are probably small parts of it (with much editing) that I would be artistically proud of. DV: Allison, what was it about? Do its themes still continue through your current work? Has your voice changed? AG: It was called Letters To.. It was a series of poetic love letters to a person, but in actuality they were letters to God. My voice has evolved, changed, undergone many transformations, but it is still the same voice, coming from the same place within me, and all my work remains to and for, and ultimately, about God. DV: Having a shared artistic interest probably strengthens your marriage in many ways, but I imagine that there must be times when your individual artistic obsessions and tensions must be counter-productive as well? Do either of you have any examples of this that you wouldn’t mind sharing? AG: I fell in love with Kyp when I first heard him perform his song “Wandering Heart,” and listening to his new creations always catches my breath in wonderment. In my estimation, Kyp is in the top few greatest artists that have ever lived, and sharing this life with him is a consistent blessing and inspiration for me as a person and as an artist. KH: Nothing has ever been counter-productive in my relationship with Allison. She’s one of the greatest artists and greatest humans ever, so it’s a privilege to live and work beside her, plus she seems to be as insane as I am. 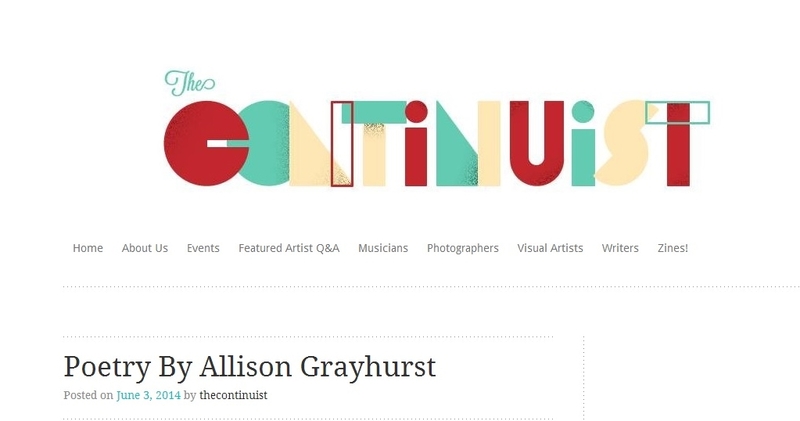 AG: I honestly can’t say that being artists has ever been counter-productive to our marriage. 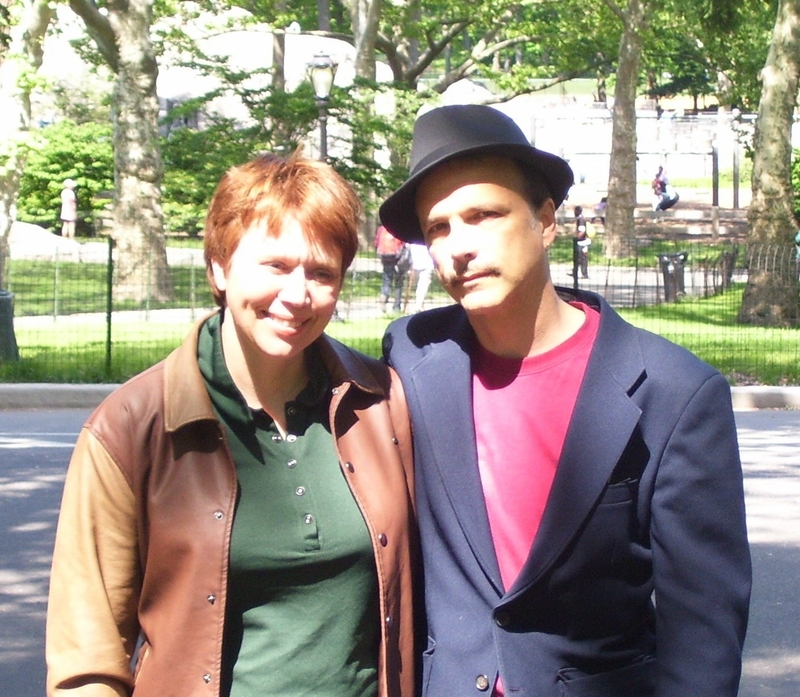 We have been together for 27 years and I have always honored and admired Kyp as an artist and all of his creative works. Throughout the years, even while raising young children, I have felt the same respect afforded to me. In fact, being artists in some way is the pulse of our relationship, and in many ways, it keeps us both alive as individuals, as well as our love. DV: Kyp, you refer to yourselves as being “insane,” but in this conversation you seem to be more sane than most couples — and certainly most artists — that I know. So, what kind of insanity are you referring to? KH: I guess the insanity is being sane in an insane world or insane in a sane world. Either way, I don’t much care. DV: Are all of your children artistic too? AG: We have two children, our oldest is 18. She is multi-talented in film, photography and writing, and is also strongly interested in politics. She attended a high school for the arts and is now in her first year at university majoring in film. Our son is 14 and is also attending a high school for the arts, with a focus on drama and visual arts. His most recent passions and pursuits have been archery and kung-fu. DV: I’d like to give you both an opportunity to talk about your work processes, in some detail. Do you treat your art like a profession, with a regular daily schedule and routine? Do you just wait to be guided by inspiration? Is it mainly a matter of “spontaneous creation” or a long process of pre-planning and extensive revision? Or, for you, is the process something else entirely? 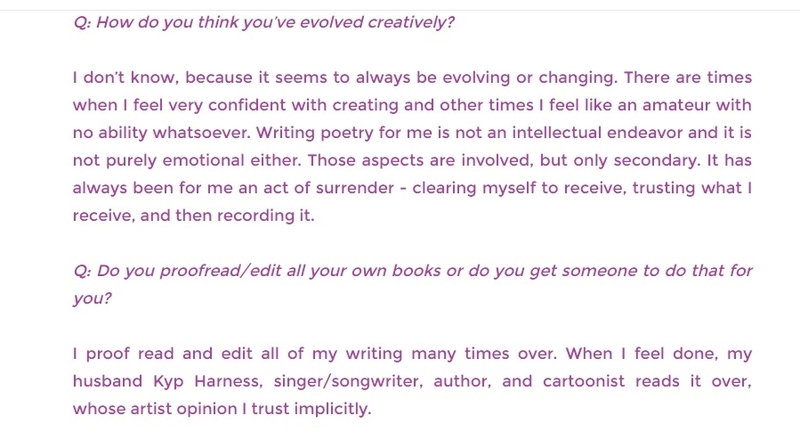 AG: My journey with writing poetry has spanned over decades and my process has undergone many changes. I started writing poetry in high school during classes, then mostly at donut shops or in my room. When my children were young or I had to go to work early, I would wake up at 5 am to get time in before the household got up. Mostly and recently I write when walking my dog. I used to write every day. It was a necessity but also a discipline. Now, I wait for the absolute need to write. Sometimes it happens at inconvenient times – making dinner, in the shower, when trying to fall asleep, etc. Sometimes I write daily, sometimes a week can pass. For a while, I tried to force myself to stop writing, to halt the inspiration and ignore the words in my head, but it ended up making me feel spiritually and physical ill. Now, I really don’t care when I write, it happens often but nothing routine. I usually write in the mornings, always long hand with pen and paper, stick it in a drawer, edit it in long hand until I type it up and edit it a bit again. The last batch of poems I wrote took about six months before I put them on my computer. In terms of editing, I do edit my work, but it is not an intellectual endeavour for me. Writing for me is a visceral process, and hopefully the poem has a rhythm and life of its own – if that is not there, the poem gets trashed. Poems come to me whole and quickly, if they need editing it is usually in small amounts for clarity sake or grammatical corrections. I keep only about one tenth of what I write. KH: I just wait until it comes. I used to try and force things but that doesn’t work for me and often just made me pissed off…so I just wait until it gets going, and then sometimes later I might have to force it and work at it to get it finished, but in a way that’s the easy part. 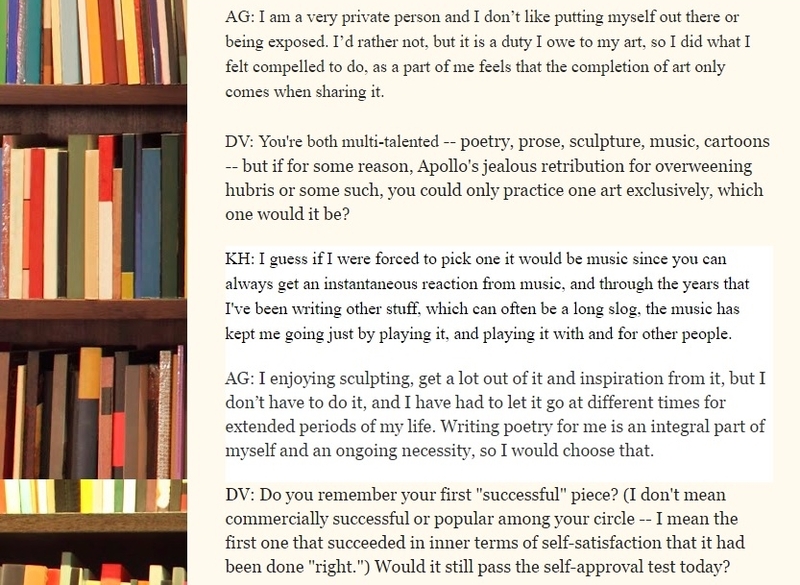 DV: Since you both do more than one type of art, is the process the same for all of them? 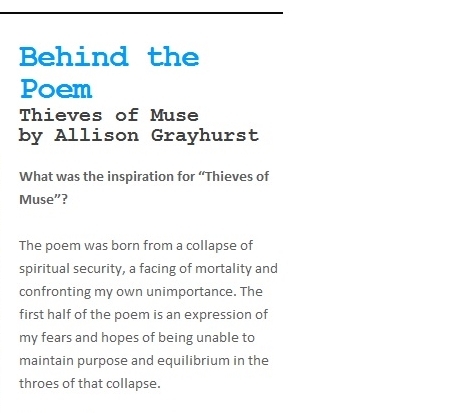 Allison, is sculpting an extension of writing poetry, in terms of how you approach it, or something completely different? Kyp, I see more of a continuity between writing and music, but what about between cartooning and music? KH: It’s all just writing in one form or another, since it’s all about ideas….ideas you put into drawn lines, or notes of music, or into a dance. The form the art takes is not that important. 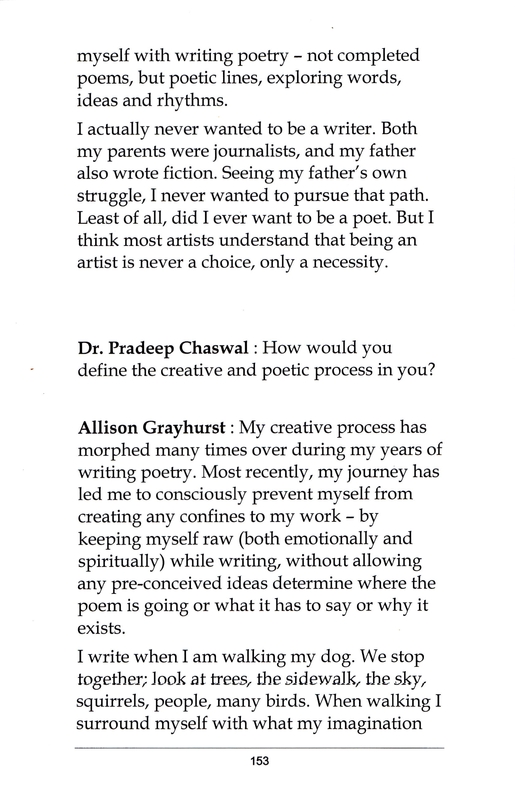 AG: Sculpting is something I do, but being a poet is an integral part of my being. I sculpt when I am inspired to. It takes months to finish a piece, and it requires a lot of patience on my part. It is like a sensual meditation. At times I have sculpted daily, at other times there are long stretches when I don’t sculpt at all. DV: You’ve both identified your chief artistic mode of expression as being part of your essence, your very being. How did you branch out from the soul-synonymous art you’ve always done into some new, and different, medium? 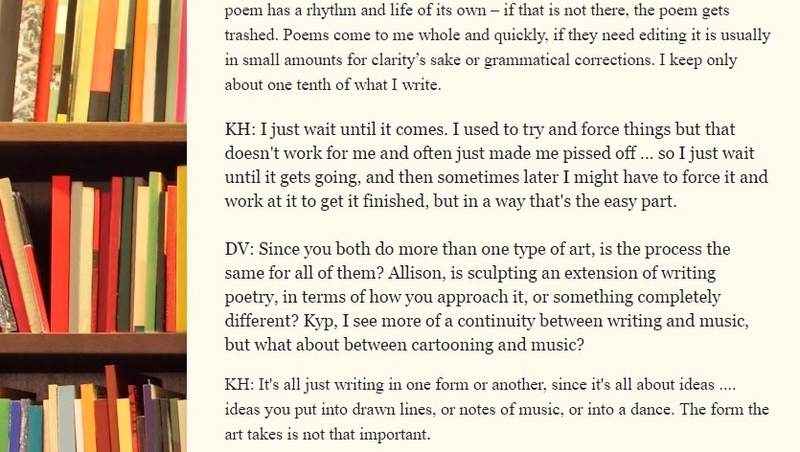 KH: No, I said it’s all the same ….it’s about ideas, whether they come through movement, singing, drawing, writing or whatever. If you’re an artist it doesn’t matter how they come out. 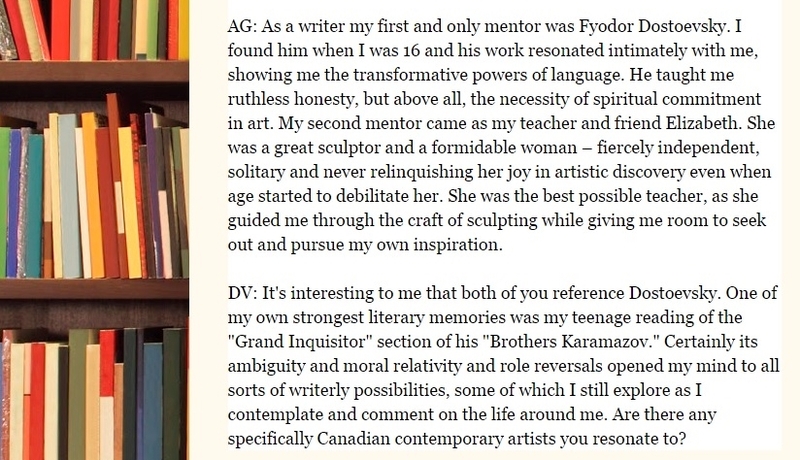 AG: For me, sculpting offered another form to express creativity when I wasn’t writing. I was drawn to the tactile and grounding nature of working with clay. DV: In your various artistries, do you have any guides, role models? Specifically, what have you learned from them? KH: My earliest guide was Walt Disney. then he was replaced by Laurel and Hardy…and they were replaced by James Joyce…then he was replaced by John Lennon and Bob Dylan , who was replaced by Dostoevsky and Henry Miller, with garnishes of Kerouac and Faulkner and Virginia Woolf on the side…and overall the poetry of William Blake and Jesus rained down on them — and in reality none of them ever replaced the other, but joined in a nurturing web of soul and brilliance, that taught me to how to see, and taught me who was doing the seeing, and what was being seen…Until now, when I have no guides and role models. AG: As a writer my first and only mentor was Dostoevsky. I found him when I was 16 and his work resonated intimately with me, showing me the transformative powers of language. He taught me ruthless honesty, but above all, the necessity of spiritual commitment in art. My second mentor came as my teacher and friend Elizabeth. She was a great sculptor and a formidable woman – fiercely independent, solitary and never relinquishing her joy in artistic discovery even when age started to debilitate her. She was the best possible teacher, as she guided me through the craft of sculpting while giving me room to seek out and pursue my own inspiration. 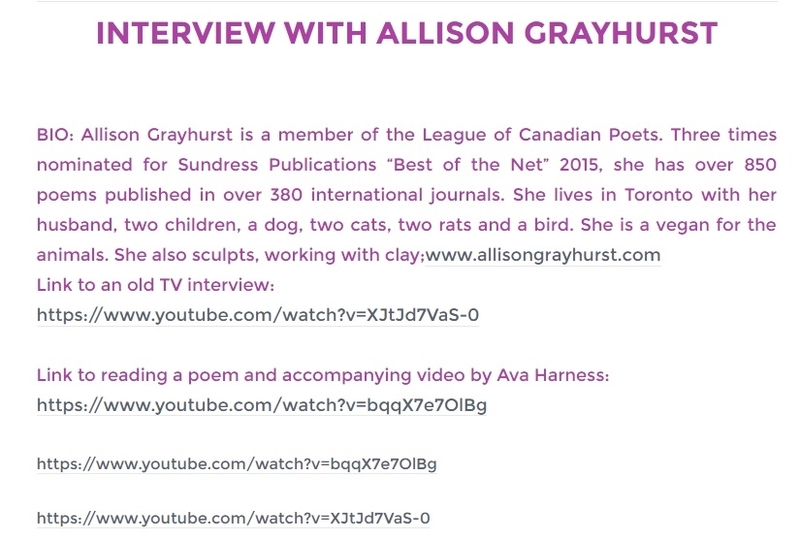 DV: Are there any specifically Canadian contemporary artists you resonate to? AG: The question has two things I don’t care about as someone who does art or when experiencing art – nationality and time-era. Great art might reflect those things or use them as part of their backdrop, but ultimately it must transcend those barriers, and any art that doesn’t is boring to me. KH: I don’t recognize nationalistic borders. DV: Well, then, what about the future? How do you see your art developing from here? KH: I hope to continue getting deeper into the art, going as far as I can with it. However many years I’ve got left to live, I know I’ll keep doing it, and for me there’s no point in doing it unless I can get to newer deeper places, in whatever medium I’m inspired to work in. That’s what makes it exciting for me, and my goal is to keep excited! AG: I don’t know. 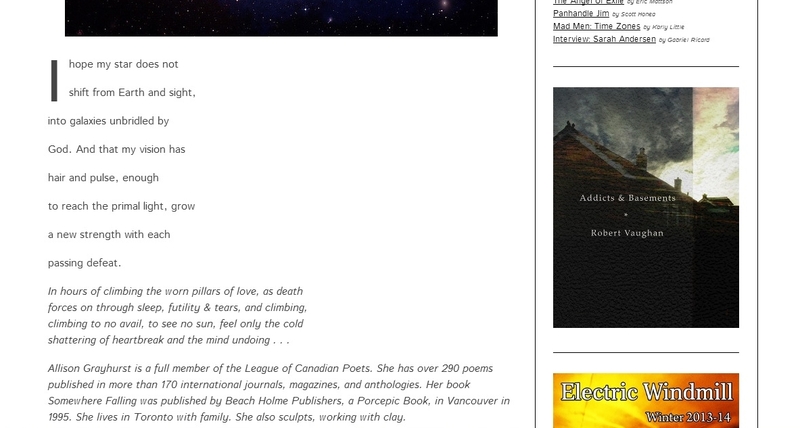 I’ve just completed a goal of having all the poems I wanted published or accepted for publication and it has left space and a sense of freedom inside. I just feel open, patiently in-waiting and excited to see where my writing takes me next. DV: On that note, I’d like to thank both of you for allowing me to intrude into your creative and personal lives. And, of course, I hope we all get to see, or hear, much more of your work. shattering of heartbreak and the mind undoing . 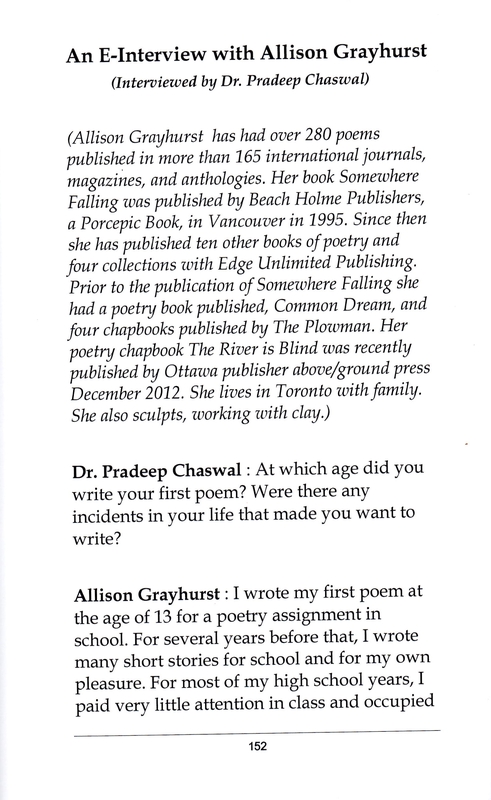 . .
At which age did you write your first poem? Were there any incidents in your life that made you want to write? I wrote my first poem at the age of 13 for a poetry assignment in school. For several years before that, I wrote many short stories for school and for my own pleasure. For most of my high school years, I paid very little attention in class and occupied myself with writing poetry – not completed poems, but poetic lines, exploring words, ideas and rhythms. I actually never wanted to be a writer. 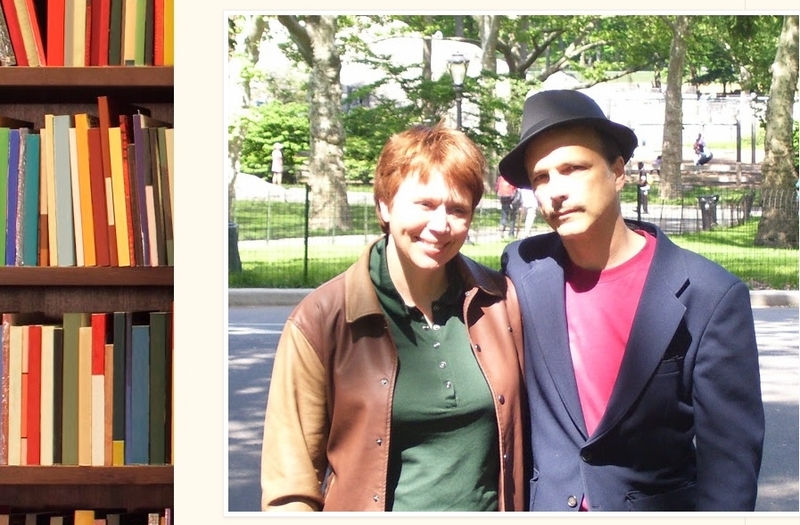 Both my parents were journalists, and my father also wrote fiction. Seeing my father’s own struggle, I never wanted to pursue that path. Least of all, did I ever want to be a poet. But I think most artists understand that being an artist is never a choice, only a necessity. How would you define the creative and poetic process in you? My creative process has morphed many times over during my years of writing poetry. Most recently, my journey has led me to consciously prevent myself from creating any confines to my work – by keeping myself raw (both emotionally and spiritually) while writing, without allowing any pre-conceived ideas determine where the poem is going or what it has to say or why it exists. I write when I am walking my dog. We stop together; look at trees, the sidewalk, the sky, squirrels, people, many birds. When walking I surround myself with what my imagination reveals, and my dog keeps me grounded. This is what feeds me for now. I just finished a 12 page long poem called Walkways. Where I am going as a poet next, I really don’t know. 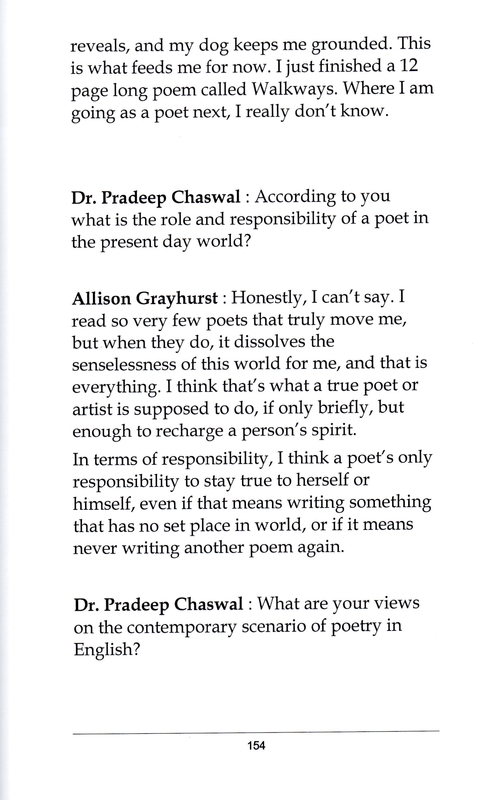 According to you what is the role and responsibility of a poet in the present day world? Honestly, I can’t say. I read so very few poets that truly move me, but when they do, it dissolves the senselessness of this world for me, and that is everything. I think that’s what a true poet or artist is supposed to do, if only briefly, but enough to recharge a person’s spirit. In terms of responsibility, I think a poet’s only responsibility to stay true to herself or himself, even if that means writing something that has no set place in world, or if it means never writing another poem again. 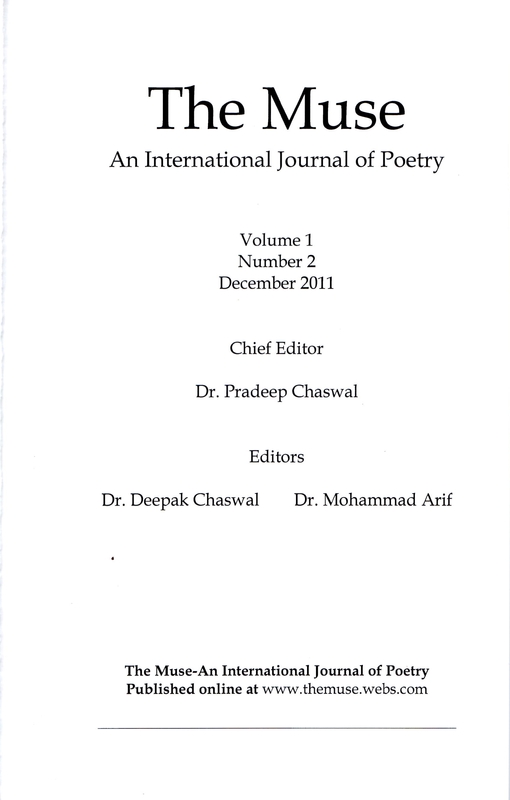 What are your views on the contemporary scenario of poetry in English? Not good. 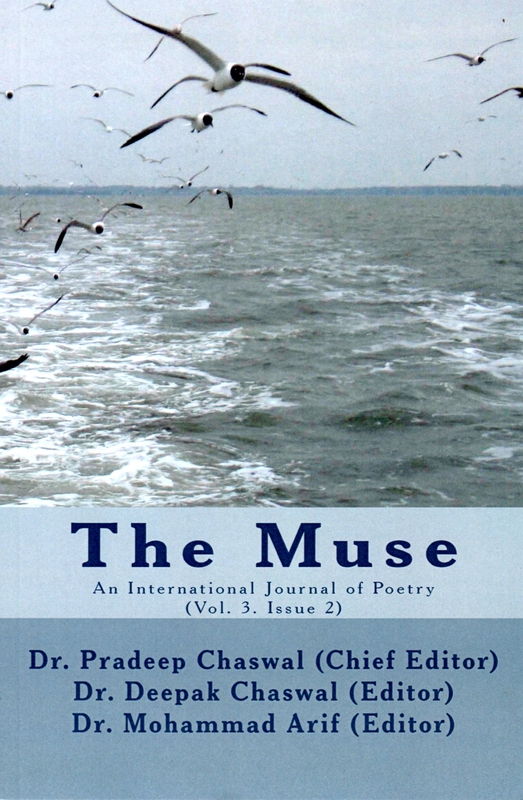 Most poetry I see out there is very badly written, from a literary point of view, though it often has heart. On the other side of the spectrum, there are many very well-crafted and clever poems I see that receive the recognition of greatness, but to me, more than not, they lack heart or vision. Such poems used to intimate me when I was younger. Now I can barely get through them. But I think that is the case with poetry as it is with all other art forms – it is a rare joy when a work of art or poem is able to surprise with its magnificence. Would you please throw light on your latest book of poetry? 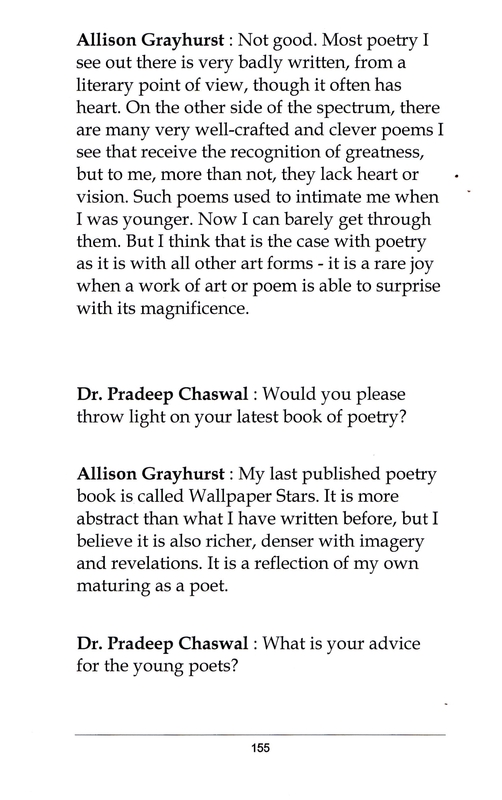 My last published poetry book is called Wallpaper Stars. It is more abstract than what I have written before, but I believe it is also richer, denser with imagery and revelations. It is a reflection of my own maturing as a poet. What is your advice for the young poets? Write only if and when you have to. It has to be like eating or sleeping – something that must be done even if you wish you could avoid it. 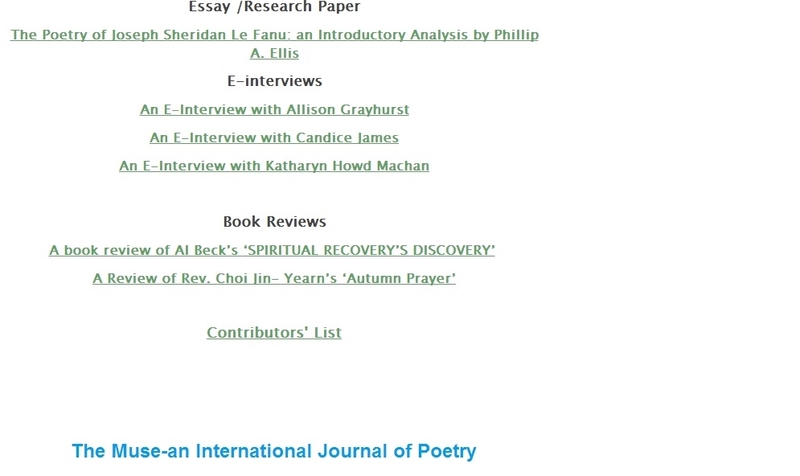 Would you share with our readers any memorable events in your poetic career? 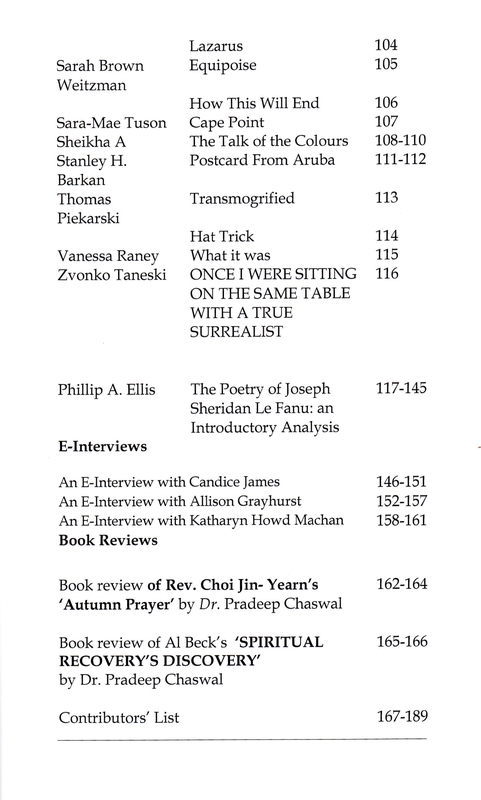 In 1995, I got my first poetry book published by a respectable publisher. The day I received the acceptance was one I won’t forget. 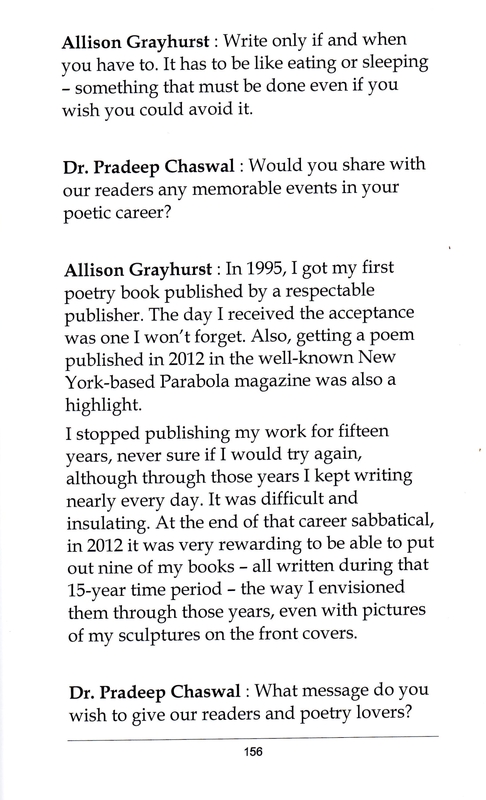 Also, getting a poem published in 2012 in the well-known New York-based Parabola magazine was also a highlight. 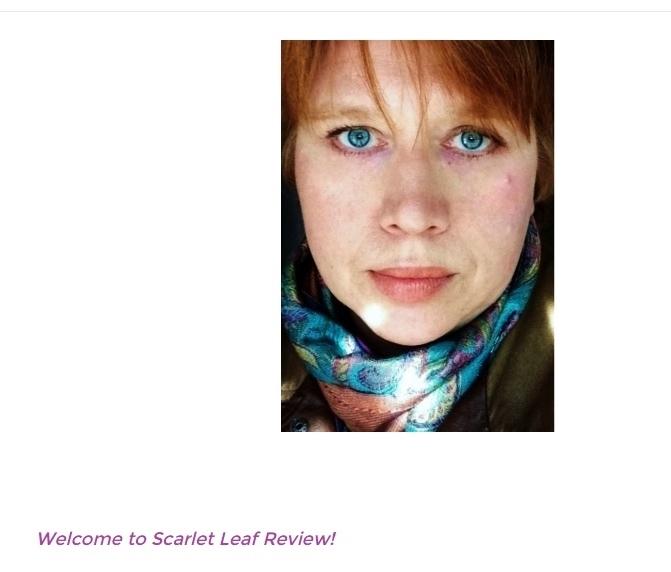 I stopped publishing my work for fifteen years, never sure if I would try again, although through those years I kept writing nearly every day. It was difficult and insulating. At the end of that career sabbatical, in 2012 it was very rewarding to be able to put out nine of my books – all written during that 15-year time period – the way I envisioned them through those years, even with pictures of my sculptures on the front covers. 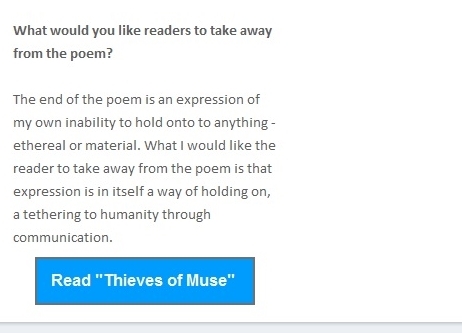 What message do you wish to give our readers and poetry lovers? 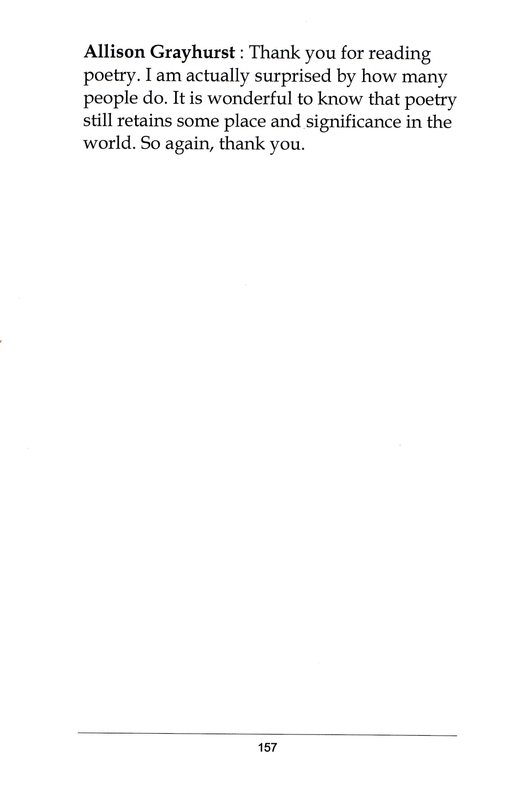 Thank you for reading poetry. I am actually surprised by how many people do. 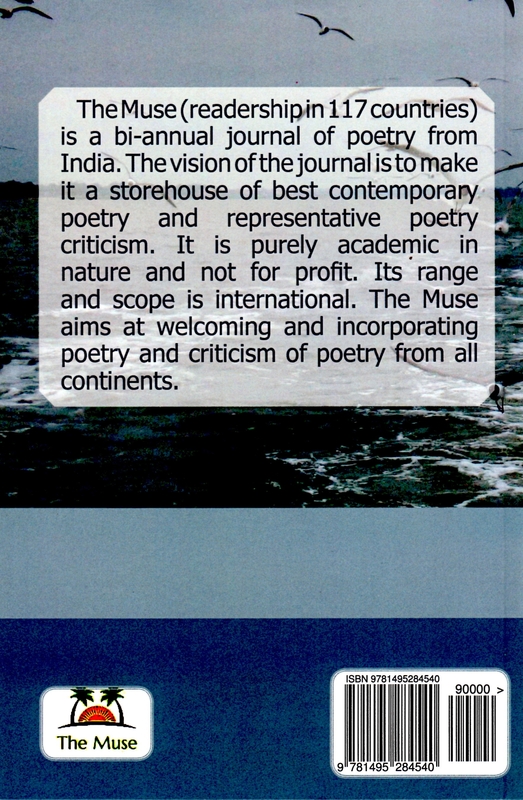 It is wonderful to know that poetry still retains some place and significance in the world. So again, thank you.